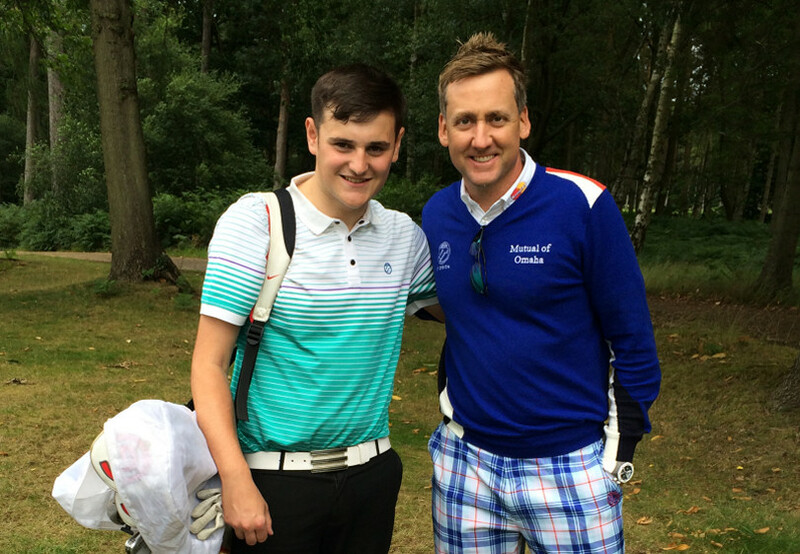 Shrewsbury Golf Club Junior Champion, Dan Sherratt and his brother Joe, have spent a day with Ian Poulter playing in his Junior Invitational at Woburn, an annual event for juniors who apply with a handicap of 15 or under. The Junior invitational brings together the most talented junior golfers from across the UK to inspire them and give them a taste of playing golf at a world class level. The day was action packed including a nearest the pin challenge on a golfing simulator trying to get the ball closer than Ian Poulter, who after deciding his first shot to three foot would be too challenging hit a second to 17 foot to get the competition under way. A golf competition followed with two division from 0 to 9 and 9 to 15 handicaps. Joe played well to secure 5th place in the first division. Dan enjoyed the day playing in the second division. “It has been a fantastic day that I will remember for ever. I thought Ian Poulter would make a guest appearance, but he was there for the whole day providing us with great experience from teaching us about controlling a ball to inspiring us to take up the game professionally with a taster of what it is like to be one of the world’s best,” said Dan Sherratt. In addition to a closest to the pin competition was a golf clinic demonstrating the level of skill needed to be a successful professional. “Ian showed us how to hit a driver of the deck, hitting both high shots and low shots. The ability to control a ball can give you a great advantage when you need to manufacture a shot,” reflects Joe Sherratt. The day concluded with a barbeque and the opportunity to hang out with one of the best dressed golfers on tour. “It was amazing to spend a day with Ian Poulter and learn such a lot. He even had a best dressed completion and a prize for best hair. I also got to play a fantastic golf course. I played the Marquess Course at Woburn Golf Club, home to this year’s British Masters, it doesn’t get much better than that,” said Dan. The Ian Poulter Invitational has been played since 2007, when Ian Poulter created the competition to provide support for the next generation of golfers in the UK. “Today is about spending time with talented junior golfers to give them an experience that they might remember down the line. It may provide a turning point for them or simply be an inspirational day that helps their golf progress. It’s really about giving something back,” said Ian Poulter. Dan and Joe had their photograph taken with Ian, as well as receiving a tailored goody bag, with lots of golf-related gifts, including an item from Ian Poulter’s IJP Design Collection.